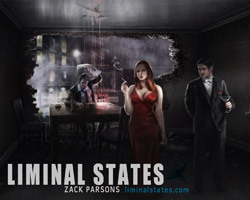 Directed by Dan Sollis and based on the novel Liminal States by Zack Parsons. Camera equipment provided by FAVA Rental. Much love to the cast, crew and supporters of this project. 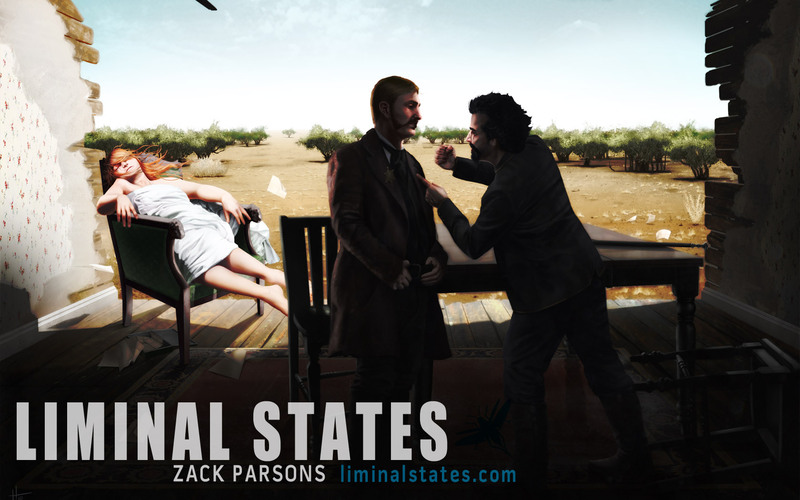 I hope you are enjoying your copy of Liminal States and you are looking forward to the short film coming in a week. If you missed out on the first opportunity to receive a Rapid Response patch with your hard copy of Liminal States, I have good news. 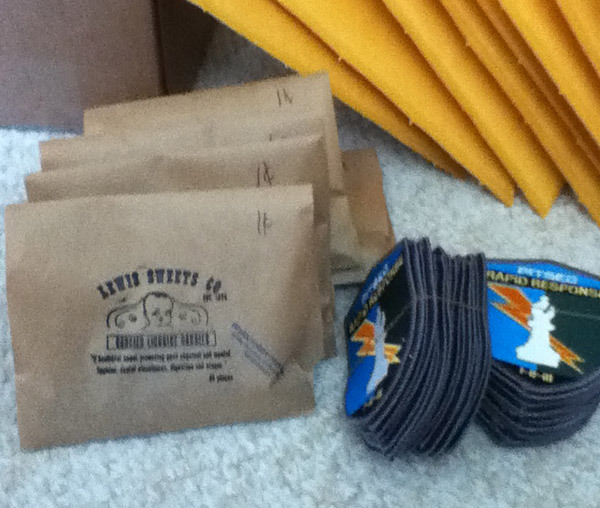 I have 50 brand new patches, plus a bunch of bags of Lewis Licorice Dandies and signature stickers. I'll give away all three in each envelope for as long as supplies last. If these sound like things you would like to purchase, unfortunately you can only get them for FREE. If you purchase a hard copy of Liminal States, all you have to do to get a FREE patch plus a FREE personalized signature sticker, is take a picture of yourself holding your copy of the book along with your name on a piece of paper. You don’t even have to show your face, just your hand holding the book. Then send the picture along with your mailing address to: bonus@liminalstates.com Wait about two weeks and, hooray, free patch and personalized signature. Kindle owners and ARC recipients are not included in this offer, sorry folks. There’s no easy way to handle that. If you purchased multiple copies of LS you need to include them all in the picture at once and your limit is three patches/signature stickers. If you recently purchased another copy and you are requesting a second patch/autograph you must include both new and original book in the photo. I have about ten requests for patches sitting in my inbox that have not yet been answered. These will be the first to receive replies. If you have been holding off on buying a copy or thinking about getting one for a friend, now would be a great time to do so. This is the last time I will be giving away these patches like this. If you know of a website or magazine that should review Liminal States, a place that reviews or features books like LS, tell them so using their comment system or email. But, most of all, enjoy the book! "Parsons whips up an awe-inspiring, helter-skelter journey through mind-blowing SF, western dime novel, noir mystery, and near-future dystopian horror that somehow manages to become a cohesive, thought-provoking whole. Gideon Long is a brutal and brutalized man who is in the process of getting himself shot in 1874 when he stumbles onto a pool that will create a copy of him every time he dies. Warren Groves, husband of Long’s lover Annie, becomes Long’s unwilling partner in resurrection, and the two have an uneasy history down the years. In the 1950s, Warren meets a woman who looks just like Annie, and events begin spinning out of control as the mysterious pool turns out to have its own agenda. There’s no way a novel with this many moving parts should hold together, but it does, and even readers initially daunted by the jumble will soon be glad to go wherever Parsons takes them. (Apr.)" 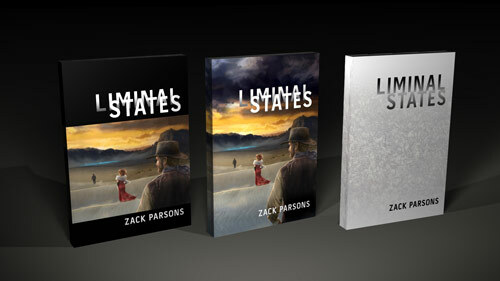 After more than two years, Liminal States is available now at Amazon. It is also available/or will be available by April 2nd at other retailers. 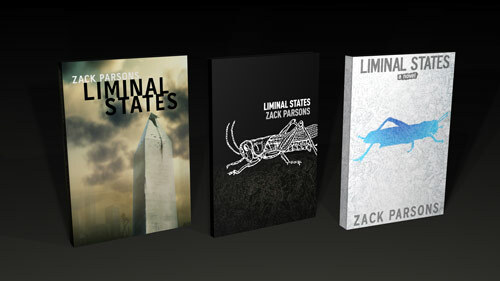 If you have a cool bookstore in your town then support it by purchasing a copy of Liminal States there. This has been a labor of love and I hope you enjoy the result. The trailer was directed by Dan Sollis and stars Nathan Nolan and Annabel Topham. Featuring an original song by Conelrad. The third sample chapter from Liminal States advances the story to the 21st century. If you do not want any hints or spoilers about the book you should stop reading this now. 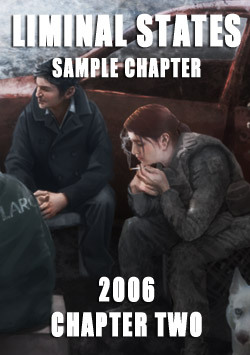 It is 2006 and Pollen "Polly" Foster, is a shamed member of the Pit Security Rapid Response unit, accused of incompetence that killed her entire team. As Polly tries to piece her life back together and recover her promising career she must confront that the world, and her own humanity, are slipping away. A sample from book one and book two were previously posted. 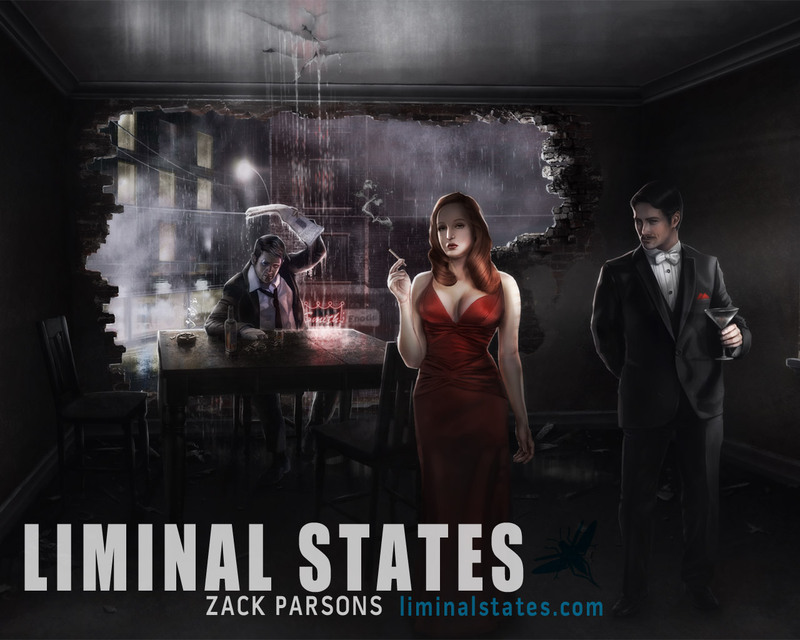 This is the third of three sample chapters available for Liminal States. 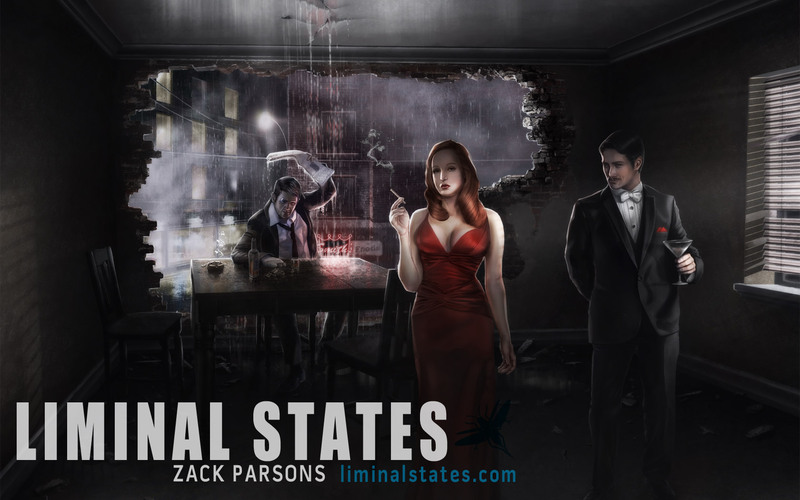 Thank you for reading and be sure to like us on Facebook and join our mailing list for news about the upcoming, post-release giveaways of special Liminal States items. Dan Sollis has created the second of three incredible trailers for Liminal States, using art by Josh Hass, music by Conelrad, and a whole lot of video editing and analog work. Please be sure to like our Facebook page over on the right there for the latest info and updates about Liminal States. Join our mailing list for exclusive and early looks at content. The Reificant, a prequel serial to the novel, begins February 3rd. 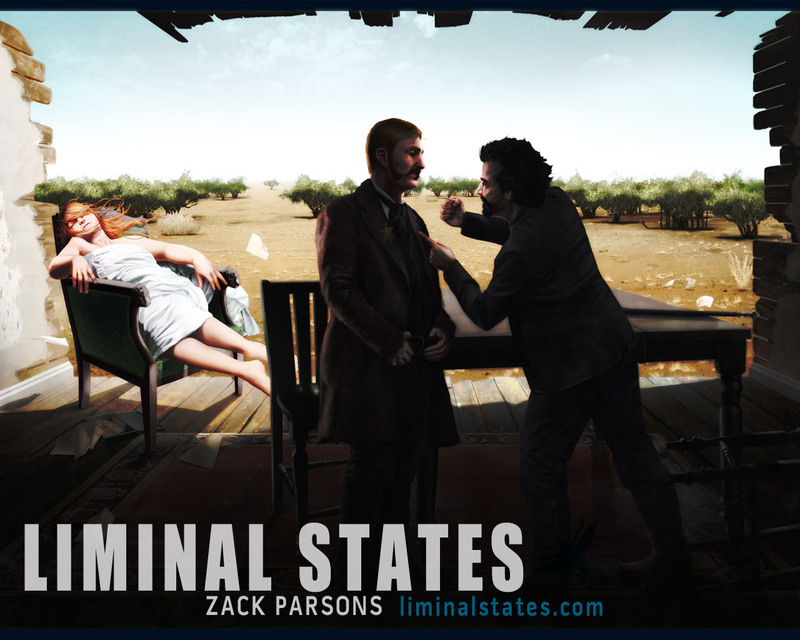 In many ways the most important of Josh Hass' artwork for Liminal States are the trilogy of character tableaus. Conceptualized very early in the process, each drew on my biographical material for the characters as well as collections of photographs from the time period. 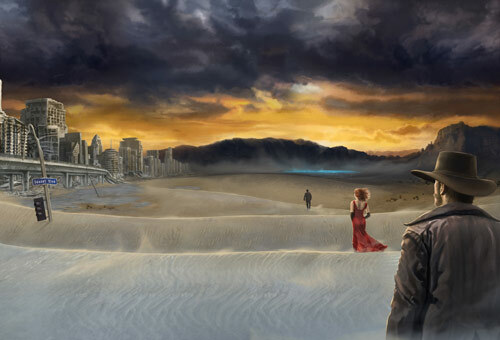 The resulting pieces depict the protagonists and antagonists of Liminal States in the three critical time periods of the novel. NOTE: The third and final image has been digitally altered to conceal information about the novel. 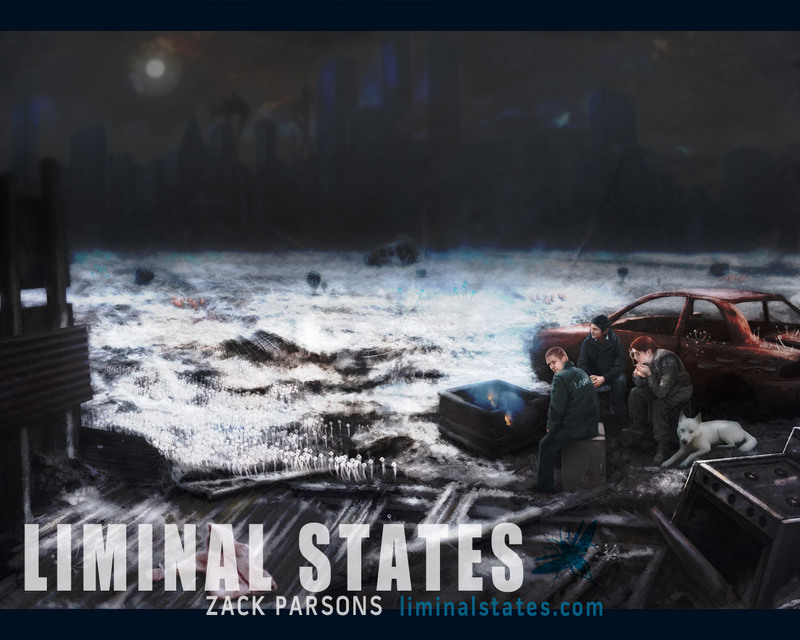 Creating the cover for LIMINAL STATES has been an exhausting process between those of us working on the creative end of the project and my publisher. The book project almost died because of conflict revolving around the cover. I won't delve into the specifics of that too much, but it's worth touring the many versions of the cover that have existed throughout the project and tell the story of how we ended up with the glowing grasshopper you have seen so many times. This preliminary mockup was created by me about six months into the project based on a simple, creepy piece of artwork created by Josh Hass. It was never meant to serve as the final cover, but more of a guide for the austere ideas I had for the cover. The title at the time, based on something George Washington said in his first inaugural address, along with the cover, were not a hit with the publisher to say the least. I wasn't too attached to it either. I still had a long way to go on writing the book and so I was happy to take the publisher's input on both title and cover. The publisher gave us pretty detailed notes. They wanted something that combined the fantastic elements of the story with the sweeping scale. 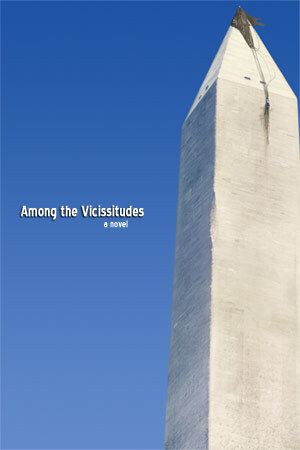 I pushed for something "simple and classic" but I was unconvincing, possibly because of my lame Washington Monument cover concept. To meet the publisher's needs, Josh and I came up with this concept of Casper Cord standing on a broken highway, aghast at this alien vista of ruined spires. It was not based on any actual event in the novel, but it conveyed the concept. When we showed them this concept, about 30% complete, they were as aghast as poor Casper and told us to immediately stop. Josh and I were pretty disappointed because, hey, cool cover on the way. Some time after cover two was aborted I had a long conference call with the art department of Kensington. The chief designer at the time had a witch's brew of notes from various people at the company. My suggestions were sidelined in favor of a very specific series of mockups to show off at meetings. Over more than a month Josh created (if I recall correctly) six different mockups of the cover. Every detail was managed between revisions and things were added as they saw fit. The process was agonizing, but the result was, surprisingly, not that bad. Maybe aimed at a different audience than I perceived was appropriate, but I could live with it and it seemed the matter was finally settled. As my writing was wrapping up and missed deadlines were being missed again I finally got a look at the final cover. A number of "tweaks" had been made, none of which really worked too well in my opinion, but none of which ruined the cover either. Then about a week later I saw the image above. It felt like a young adult or romance novel with graphic design from an early 1990s album cover. I could go on and on, but the less I say the better. By this point I had also thrown up my hands on the cover copy. Hopefully you can't read what it says. The previous cover circulated to sales outlets and everything felt final. I felt beaten. Then more changes - really odd ones like "move a ruined building to the front cover to be more science fictiony" - were suggested to appease various markets. It was too much. The final outcome on the cover was unacceptable. Dan Sollis, the guy who does the amazing video work for LIMINAL STATES engaged in a furious back and forth with the publisher. We proposed a series of last ditch emergency replacements and tried to explain the idea of creating a brand identity using the grasshopper imagery. There was no time to commission new artwork from Josh, so Dan reworked the current cover and I contacted artist Christian Schumann about the possibility of using a piece of his art - an amazing, unearthly, protean landscape piece called "under silent stars" - as the background for a royalty free grasshopper. He graciously allowed us to include his work in the pitch to the publisher. It was a simple, coherent design. Dan worked up a couple approaches to the grasshopper cover, along with a gloomy revision of the original Washington Monument as a last-ditch other option, and we submitted these to the publisher. They were rejected after a long review period and we seemed to be back to the degraded cowboy cover that had me in such a bitchy mood. The cliche goes "it's always darkest before the light." Well, just after I started the ARG and launched youwillbecome.us the project teetered on cancellation. I was miserably unhappy with the cover, my publisher was (understandably) unhappy with my attitude and then, somehow, the grasshopper came out of hibernation. In a back and forth flurry of activity a new Kensington designer worked with me and Dan to develop the final cover you see above. Sadly, my friend Josh's art was not able to appear on the cover because of the sudden nature of this change and Christian's art was too detailed for use on this cover, but the end result is something I am not only happy with but proud of. I am also grateful to the publisher for seeing so much of my side of the argument. Changing the cover after cover proofs had already been printed and resubmitting it to retailer catalogs was not an easy decision for them, I am sure. The whole process, as trying as it was for everyone, seems to have been worth it. I hope you agree! 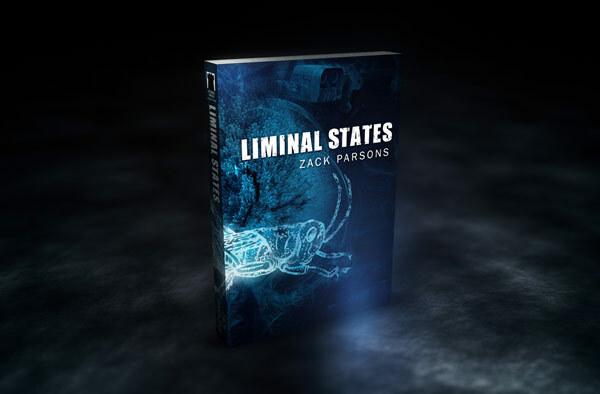 Preorder your copy of LIMINAL STATES today. Writing a novel is just a small part of the process of releasing a finished book. You have to find ways to draw attention to your novel. One method preferred by publishers is to feature quotes by various respected authors on your book's cover and mentioned in your promotional material. For a first-time novelist at an independent publisher, getting these quotes can be a daunting task. 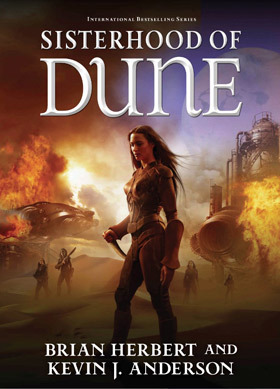 I am both fortunate and extremely pleased to be receiving a quote from Kevin J. Anderson, the #1 bestselling co-author of SISTERHOOD OF DUNE and various other Dune novels. He liked the book a lot, and I'm sure you will be seeing his quote in LIMINAL STATES material in the near future. I wanted to take a minute to thank him personally. He did not receive a galley, he received a bound manuscript, which was huge and unwieldy and arrived not long before Christmas. KJA is a hero for giving me a quote under those conditions. If you have any interest in the Dune books, please, check out SISTERHOOD OF DUNE's cool trailer and head out to see him on his book tour. It starts tomorrow in Lone Tree, Colorado. Possibly under the tree. If you see Kevin at his book signing because of this post, please be sure to thank him in person on my behalf. He's a busy author with a lot of projects going on. He could not have been nicer and more helpful to somebody just starting out in fiction. 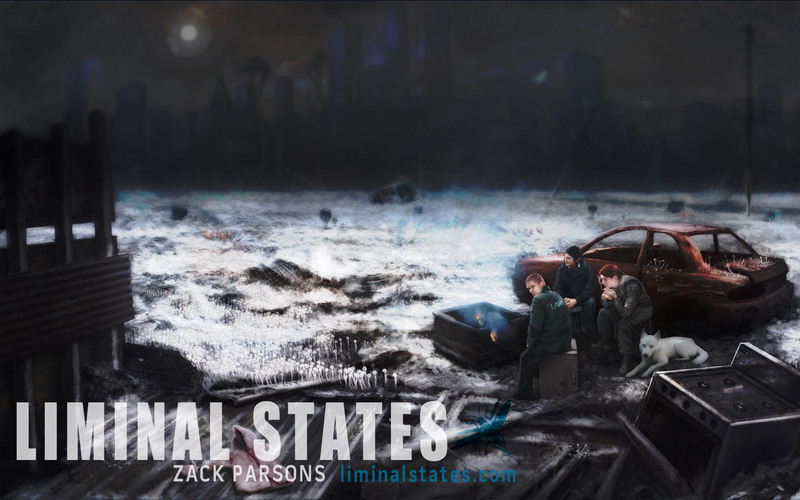 Welcome to the website for LIMINAL STATES, my debut novel. It is an American story about American characters, spanning over a century of history. You can get a good summary of the project by hitting the about section of this website. If you want to catch up with what has happened in the online narrative, check out the alt reality narrative section. I wanted this news area to be something casual. Those of you who are familiar with my work on Something Awful might wonder why I have not written one of my weird sci-fi serials in a long time. Here is your answer. About two years ago I came up with a concept for a novel and approached my publisher. I explained to them that people seemed to like my sci-fi serials. My publisher gave me a gentle push in a different direction. They weren't looking for fiction. Undeterred, I worked with my editor, Richard Ember, to put together a major proposal to the publisher to convince them that some weird comedy guy could make an attempt at a serious science fiction novel. I'll admit, I really sold it to them. I said, "There will be websites and an ARG and music and videos and all kinds of original artwork." Just like that. Run on sentence and everything. They gave in. They caved! And then it started to sink in: I had to deliver on that promise. I had to get all these other talented people onboard with my weird scheme. Josh Hass was onboard first. He is my artist whenever I can get him and his schedule allows. When Josh and I worked together on one of my serials, That Insidious Beast, we roped in an amazing video guy named Dan Sollis to work with us. Having his talent fully engaged has been helpful beyond all reasoning. We also cribbed music from Conelrad for That Insidious Beast, but I needed something original for this one. Incredibly, Conelrad also jumped aboard and agreed to produce original tracks based on the ideas and themes presented in the text. These three talented dudes embarked on a two year process with me. It has had its share of difficulties, which I may relate later, but I wanted to thank each of my collaborators for their efforts. The result of all this hard work - the novel, art, music and videos - will be seen in the coming weeks. Everything, except the complete novel itself, will be released free of charge and posted here. 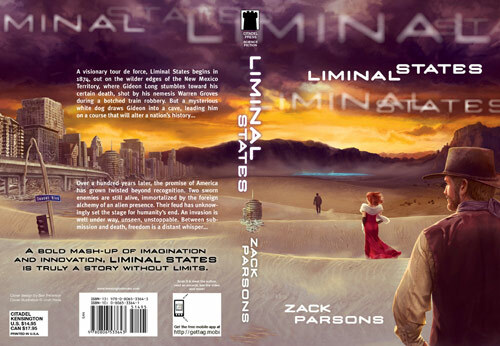 LIMINAL STATES is available for preorder now and will be in stores on March 27th. 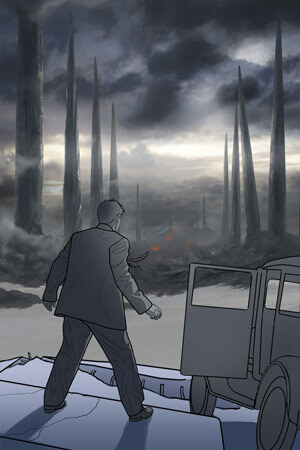 A prologue serial, The Reificant, will begin appearing February 1st. Receive early and exclusive content!